Do you gag at the thought of eating Brussels Sprouts? Do they immediately conjure memories of eating grey over-boiled sprouts for dinner? Well the Adam's family recently held the inaugural 'Sproutfest' in the hope on converting people just like you! The Adam's farm is a three-generation family affair located in Coldstream (my home town!) in the Yarra Valley. This may ring a bell for Melbournians as the place that often records the lowest overnight temperatures on the daily weather report. And although this cold dense air made for some very uncomfortable early morning walks to catch my school bus, it is apparently perfect for turning sprouts nice and sweet. And the Adam's farm grows lots of sweet sprouts! My husband has occasionally worked on the farm during school holidays helping to haul sprouts and my mum also worked on the farm back in the day. Unfortunately I still have strong memories of the putrid smell that accompanied her return from a long day spent picking sprouts in the mud and rain. However I have overcome that unfortunate association and I am now a lover of this misunderstood vegetable. My Green Goodness Soup is now one of my favourite ways to enjoy them. 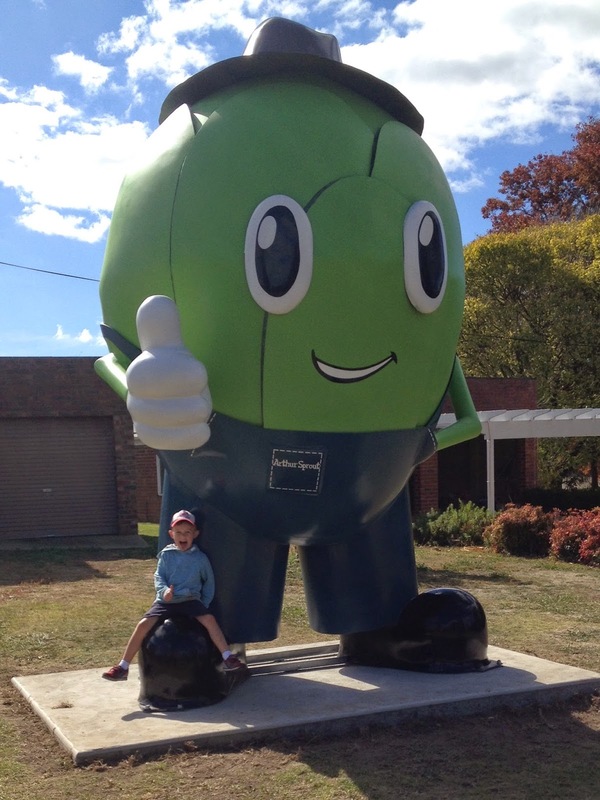 The highlight of SproutFest was the unveiling of the 'Big Sprout'. The big sprout is a 4m high Brussels Sprout located at the entrance to the farm. There were plans for a bigger sprout to be located in a more prominent highway position, but the council wouldn't come to the party on that one. It is named Arthur Sprout, in honour of farm founder Arthur Adams, whom his family have referred to as "the guru of sprouts". It was a huge success with an estimated 5000 people coming out to enjoy the fun on a beautiful sunny Sunday. My auntie works at the farm and she said they sold 200kg of fresh sprouts in the first 2 hours and ended up selling their Monday orders too. However for me, the highlight was Reuben Nieuwesteeg's cooking demonstrations. Rueben was extremely personable and knowledgable and he made some delicious dishes that made Brussels sprouts the 'hero of the dish'. I have since discovered that Reuben is the the head chef at Billy Goat Brasserie a local restaurant I have heard good things about and based on his demonstration I am now very keen to try it out for myself. Poached egg and Brussels on toast with haloumi, fried bacon, smoked salt and mustard side. Sprout leaves, cherry tomatoes, mung beans, sunflower seeds, linseeds, parsley, julienne apple, finely diced shallot with a classic dressing of olive oil, apple cider vinegar, mustard, lemon juice, salt and pepper. Quartered boiled sprouts, quartered boiled beetroot, watercress, fetta, crisp prosciutto, chervil, salt and pepper. Boil quartered sprouts until just soft and set aside. Cook fettuccine as per packet directions while you are cooking the other components of the dish. Cut chorizo into thin slices and brown off in a heavy pan. Add the sprouts and brown off. Take off the heat and add a chopped garlic clove, 4 sprigs of finely chopped parsley, 1 anchovy, the rind of two lemons and the juice of 1 lemon. Add cooked and drained fettuccine to pan, along with some olive oil to coat. Toss well and plate. Serve with shave Parmesan and micro parsley. You can find more Adams' family favourite sprout recipes on their facebook page. I have heard from multiple sources that the soup recipe handed down from their grandmother is amazing! And what better way to finish a sunny afternoon in the Yarra Valley then with a visit to the Ice creamery and chocolaterie? The dark chocolate gelato is incredible! Tell me, are you a fan of Brussels Sprouts? How do you like to cook them? I am so glad that ice cream wasn't brussel sprout flavour! I like them, could even love them if anyone cooked me those 3 toast recipes, but I'm not so sure I'd go to a festival for them. Poor little misunderstood veggie. I know, a sprout festival. We went to support the Adam's family thinking they wouldn't get too many people there and we were blown away by the numbers! It is very misunderstood, it needs to get trendy - maybe salted caramel sprouts! I didn't buy Brussels sprouts this week but I will be next week, loving all your suggestions of making them hero's. Sitting in front of that Chef watching him cook must have been fantastic! I hope you got to taste test! Oh that fettuccine sounds amazing! I must admit that i don't cook with brussel sprouts much at all - but maybe I need to give them another go with these recipes! And the Yarra Valley Chocolaterie.... hands down.... best place ever!!! Sproutfest sounds like a great idea! I haven't had spouts for years - due to bad flavour memories and not knowing what to do with them. I think it's time I gave them a second chance.